Recently I signed up for the Fox 2 21-Day Weight Loss Challenge which starts on March 30th. As I approach my 2-Year Grain-Free Anniversary in May I have a few short-term goals on the horizon so I figured I have nothing to lose except more weight! 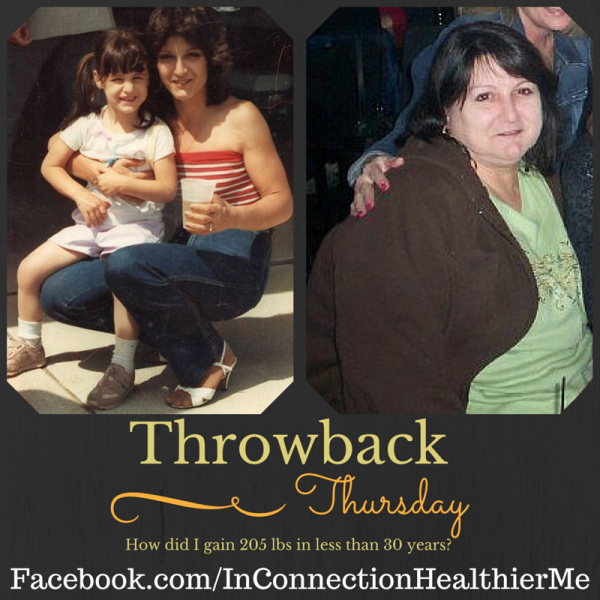 10 pounds – From Clinically Obese I to Overweight! 15 pounds – Half my size! 35 pounds – Normal weight! 45 pounds – Goal weight of 125 pounds! I’m excited about the challenge and about being a part of the challenge Facebook Group (1,900+ members and counting!) So why am I also sad? Over the last few days I’ve reflected about how far I have come in my weight-loss journey. I have improved in so many areas, some expected and some surprising. But by looking back I had to take a close look at how I ended up morbidly obese in the first place. Which makes me sad. Growing up I had always been overweight. I lost some weight after leaving high school. I got married and started a family and ended up gaining back the weight I lost. I hit the gym, went on a diet and got down to 105 pounds – a size 4!! But over the next 30(+) years I gained 205 pounds and hit my high weight of 310 pounds in 2010…a size 32!! How? Why? I looked at old photographs and my weight loss graph and the memories came flooding back. The accountant in me had to analyze the data so that is what I did. And the answers surprised me. I thought I would discover some unique fact about my situation…something that would explain away the pounds…I was looking for an excuse. I already knew that part of the reason for the gain was because I had just stopped caring about myself. But that is not entirely true. Because I did care…I just didn’t care enough to make myself a priority. Some things were out of my control but many things were in my control. Looking back now I can see all the mistakes I made. Getting Down Phase (aka Grain-Free / Sugar-Free Phase) – 2 Years: Loss of 140 Pounds and Counting! Looking back made me sad but you know what? Looking forward makes me happy! I know I am headed in the right direction to achieve my goals of health and happiness. Tomorrow I will take a closer look at the reasons for my weight gain and share some photos with you. Join me? In the meantime, head over to the Fox 2 Challenge Facebook Group. What do you have to lose? Posted on March 28, 2015, in My Story, New and tagged weight gain, Weight-loss. Bookmark the permalink. 1 Comment.